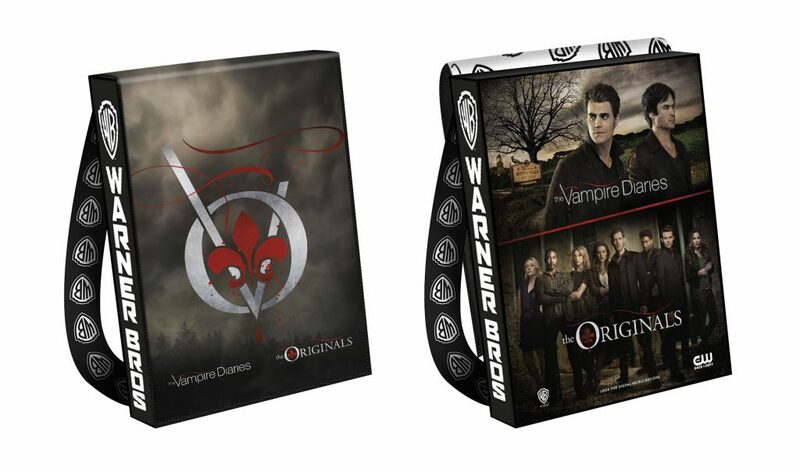 Take a look at this year’s Warner Bros.-themed Comic-Con bags, which include designs from The Vampire Diaries/The Originals, The Flash, Suicide Squad and much more! Also, see a demonstration of the cool interactive features from Ian Somerhalder! One of the highlights of Comic-Con every year is getting to see the designs for the official bags. For the seventh year in a row, Warner Bros. and Comic-Con International are collaborating to produce the collectible backpacks, which feature our favorite WB TV shows, animated series, and films! Each of the 18 different editions of the 2016 Comic-Con bag features THREE panels of artwork. On one side of the bag is a Velcro-fastened cover flap featuring iconic show-related imagery; when you open the flap, it reveals a second unique show-related design; and the Comic-Con 2016 official design appears on back. But you know WB and CCI are always taking things to the next level and this year, they’ve got something special for us. These SDCC bags have a hidden secret—an interactive, augmented reality experience courtesy of the visual discovery app Blippar! To experience the special content from the bags, fans can download the free Blippar app to an iOS or Android mobile device, then scan the bag using the device’s camera via the Blippar app to unlock the exclusive augmented reality experience. For more information about how this works, check out the videos below with a special demonstration from our boo, The Vampire Diaries star Ian Somerhalder! Every time I’ve been at SDCC, I’ve gotten a TVD or The Originals bag, so I’m hoping I can continue the trend and snag this year’s combo design. Which designs stand out most to you? Share your thoughts in comments!